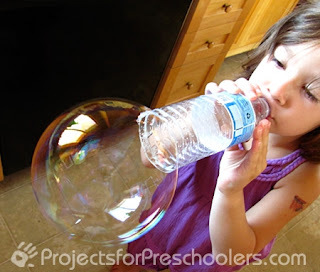 -- Make giant water bottle bubbles or great idea for kids who can't quite blow bubbles yet! Sometimes little ones have a hard time blowing bubbles with traditional bubble wands. The wands are often slippery and difficult for little hands to use. Grab some bubble solution on Amazon! -- This is a thrifty and simple idea! 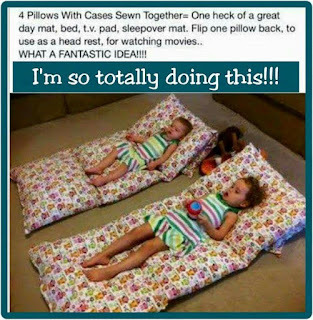 Use up those old pillowcases (or buy cheap at the thrift store) and sew together, insert pillows, sew up ends! Optional: use Velcro® or snaps, so you can remove for washing. Grab some super cheap pillows and pillowcases on Amazon to make this project. Here is something everyone will love! Imagine the look on your child's face - it is something they will never forget! 3. Seal the top with a lid. 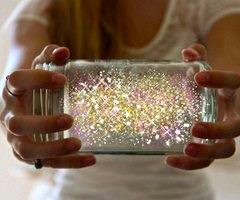 Check Amazon for Fairies in a Jar craft supplies. -- This one looks like so much fun - if I still had little ones, I would make it. -- The water wall was a structure created using a variety of plastic containers drilled onto wooden board in such a way that water is directed in various streams, drips, and flows when poured over-top, and collected in containers below. Check Amazon for more water wall ideas!